Better than cupcakes, as classic as apple pie. You don't have to be a breakfast lover to appreciate doughnuts. Few things are more perfect than a doughnut: Iced with crackly glaze that melts upon contact, this simple fried pastry has the ability to lift the foggiest of mornings into perfect bliss. The question is: where to find the best one? 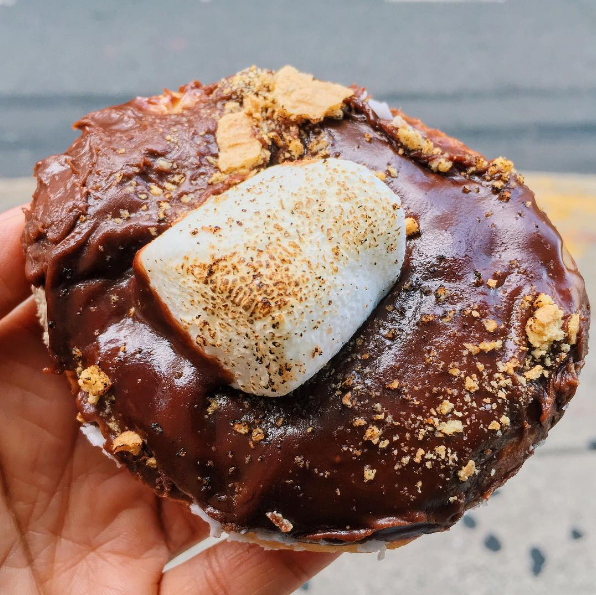 We asked Yelp for the most popular doughnut shop in every state (plus D.C.) — which they measured using an algorithm that looked at the number of reviews plus the star rating for every doughnut business on Yelp. Here are the 51 best spots to find glazed, sprinkled, and chocolate ganache-stuffed doughnuts — from Yelp users who love them as much as you do! "Always [a] stop on our way to the family's condo on Dauphin Island. 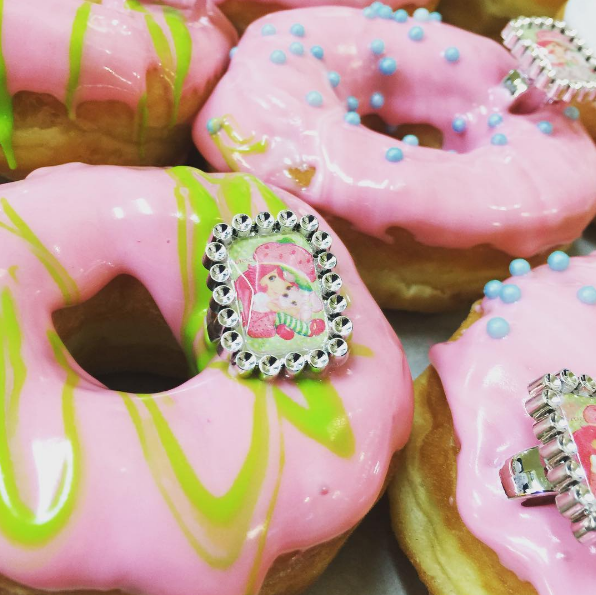 I have now tried all of them and the plain glazed donut is my favorite!" —Yelper Cynthia L.
"This is definitely a 10! The best donuts and pastries I have eaten... Bar none! Largest selection of pastries anywhere. The folks that own this place are a 10, also. They make you feel better for having been there." —Yelper Mike F.
"We just moved here from Vegas and I have been hard-pressed to find eateries in Alaska that compare. Donut King meets that challenge. Their donuts are so delicious and you don't get that waxy lard film in your mouth. The glazed old fashioned is my favorite by far." —Yelper Tiffany B. "Delicious, light, moist donuts with wonderfully flavorful, not overly sweet fillings." 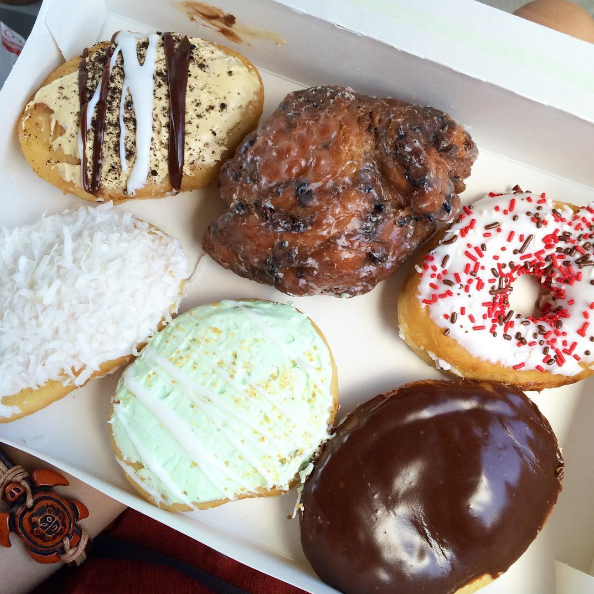 —Yelper Joanna E.
"The Local Donut has the best raised dough in Arizona. For me, it starts right there and it can only be better once you perfect that. I would have to rank Creme Brûlée at the top because of its likeness to the original flavors you would taste at a French restaurant. The semi-sweet cream and the light frosting bring it all together." —Yelper Kurdy S.
"The potato flour in the recipe gives these big, fluffy pastries a delightfully soft texture with a crisp surface and slightly nutty flavor... What else could you ask for in a donut?" —Yelper Jay L.
"They are literally the best donuts I’ve ever had in my life. And they taste the same as they did when I was little. Simply perfect." 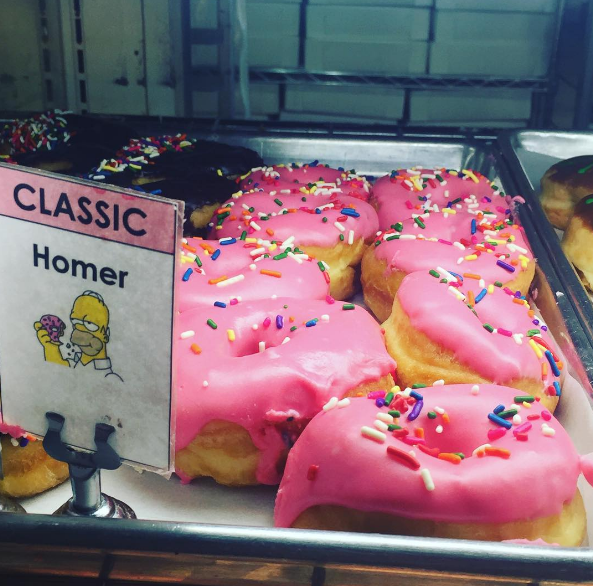 —Yelper Velma D.
"This place is first and foremost a cake bakery, and it shows in their donut selection. I got a very tasty fresh banana nut donut today. Previously, I’ve had blueberry donuts, and an old fashioned that was filled with pineapples. All were very good — I’d recommend this place highly!" —Yelper Tony O. "The blueberry, pistachio, and custard-filled donuts are absolutely delicious." —Yelper Nefarious W.
"Love this place! Donuts are gooooooooood and friggin cute. Bonus: you can fill almost all of their donuts with different types of filling!" —Yelper Danielle G.
"If I had to choose one food for the rest of my life, it would be Coloradough's donuts. They have great breakfast items and coffee, too!" —Yelper Kassidi T.
"New England is the birthplace of donuts and it takes a certain artistry to create these evil delights. They have like seven kinds of jelly donuts! There’s one called something like ‘Mary’s Special’… Imagine a Boston Cream, filled with chocolate on top but instead of the cream inside, they fill it with blackberry jelly." —Yelper Mark B. "Absolutely amazing donuts! I had the vanilla bean donut and the brown butter donut and let's just say the very next day I came back for more. I came here about a year ago and I have yet to find donuts better than these." 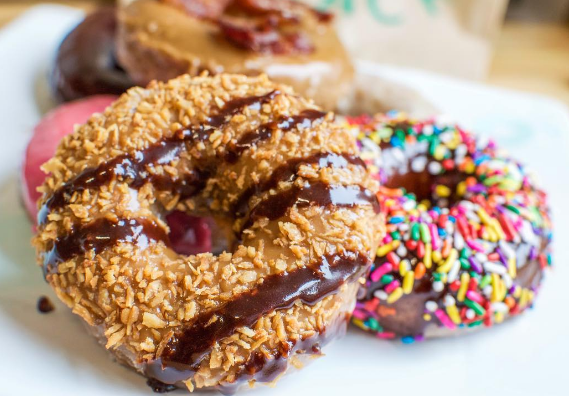 —Yelper Alexandra P.
"Donnie's has ruined all other donuts and coffee for me! The Key West and the S'mores were my favorites, but you really can't go wrong. Each day has a special donut in addition to the plain cake, Thursdays are blueberry and Saturdays are chocolate. One word of warning: don't go into Donnie's expecting a Krispy Kreme-style glazed yeast donut. They do all cake donuts with a frosting or sugar coating, no glaze or yeast to be found." —Yelper Andrea B. "Great selection of donuts! Definitely wins out against Dutch Monkey for Donut Championship." —Yelper Jacob P.
"I am thrilled we discovered this local gem. The donuts look like pieces of art. They taste amazing and the selection is awesome. This is our new favorite Sunday breakfast place!" —Yelper Alexandra W.
"OMG. I have never had donuts this good. They make them as you order and you can order any fillings you want." 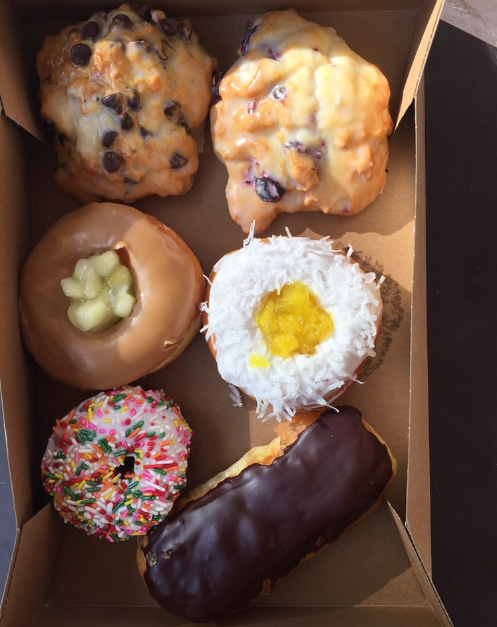 —Yelper Tran N.
"Dude, these are the best donuts I've ever had. Screw donuts with holes, these are way better. The best part is the middle! Super fluffy and soft, it goes so well with the cinnamon sugar on the fried exterior. I can't go back to regular donuts after this... We need a Leonard's in the Bay!" —Yelper Derrick V. "
"The only problem with this place is that it can't be open 24/7. These donuts are amazing: the flavors, combined with the fact they are made right in front of you, means you'll be coming back for more and more." —Yelper John P.
"I'm a fan of chimney cakes, which I used to eat in the Devon area of Chicago. This place also makes chimney cakes, a Hungarian dessert that's dough wrapped around a stick and baked. Sounds simple, but it’s like a super saiyan Churro. After it’s baked, the pastry chef spreads your choice of topping on the inside (like chocolate, caramel, brown sugar, or peanut butter). I highly recommend the Nutella filling. Just the right amount of sweet." —Yelper Gaurav B. "There’s a reason why this place won the Donut Wars competition recently. The lemon donut is sublime, the tarts are delicious, and even the plain glazed donuts are appropriately proofed and fried." —Yelper Edward C.
"I have a confession. I ate a dozen donuts. Ok, I shared a dozen donuts with my husband, and I ate at least 4 more than he did. I seriously couldn’t stop myself." —Yelper Brook K.
"We love this place. The donuts are always fresh in the morning and quite frequently still warm. One of the great parts is that they don't pre-fill the donuts. They will fill them right there for you with whatever you request." —Yelper Kyle P.
"Finally a donut shop that checks all the boxes! Clean, non-sticky floor! Freshly made, crispy, tasty donuts! Amazing apple fritters! This is a place that knows what it is good at and sticks to it. Their apple fritters are crisp with nice chunks of apples studded throughout. Love the fact that I can get a crisp crust with every Apple bite. Their maple bacon bar tastes like eating French toast and bacon in the best way." —Yelper Gerald Z. "This is a hidden gem of fluffy donuts. Their peanut butter knot is to die for! They still have a very good selection at 8am when I usually roll in." —Yelper Darcy B. "I have to agree with other reviewers. Flying Donuts has the BEST apple fritters — gooey on the inside, slightly crispy on the outside, and with more spiced apples than on any other apple fritter I've ever had." 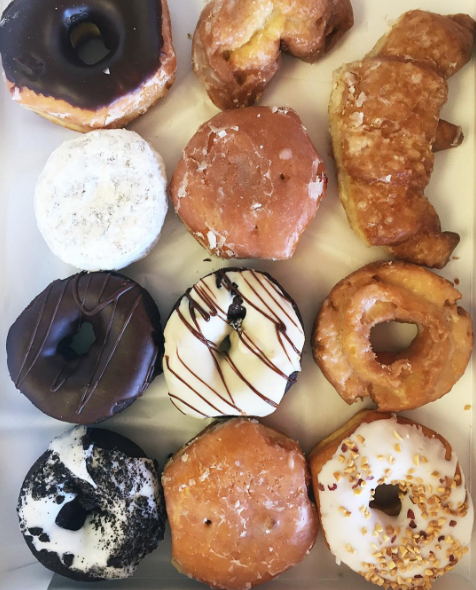 —Yelper JJ E.
"There’s so much to love about Clifton Donut Shop — an array of flavors and types to chose from, super fresh products, and welcoming staff. loved the rich and natural flavors especially the maple and strawberry glazes and the blueberries in the cake doughnut. They also have delicious-looking, filled varieties; maple and bacon, long johns; and apple fritters." —Yelper Leslie W.
"Bakers Dozen is a solid old-school donut shop. The donuts are always fresh, nice, and yeasty. Their donut holes are completely addictive and if near me will be ravenously consumed in the style of Cookie Monster." —Yelper Jen L.
"Always fresh, always creative, always served by some of the nicest people in Portland. Go check them out on the streets of Portland in the summer time or at Sugarloaf in the winter!" —Yelper Sam G.
"Melt in your mouth delicious! Do not pass this truck without stopping; in fact, follow them on Facebook and seek them out!" —Yelper Sarah A. "Everything is made in-house and it's 24/7 so it caters to every crowd and lifestyle." —Yelper Graham W.
"The honey-glazed was absolutely wonderful, my favorite of them all. I think it says a lot about a place when the basics are done so well." —Yelper Marjory B. 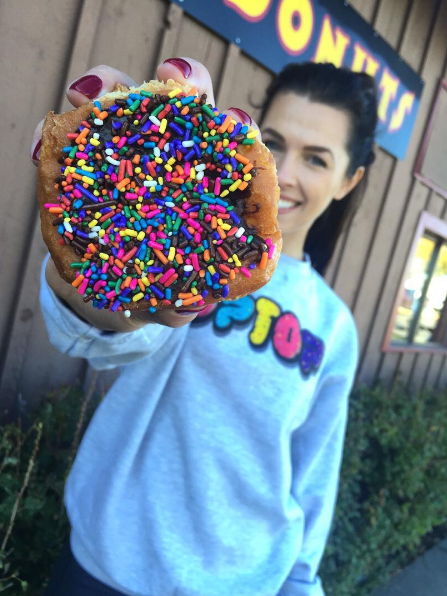 "I lived near Donut Shack for 17 years, and never thought this little place could possess the best donuts I've tasted in all of the northeast. I've told some of my city friends and they'll drive 45 minutes just to grab a dozen!" —Yelper Paul A. "These donuts are nothing less than amazing. You can get 24 donut holes for $3.99! My absolute favorite donuts are the sprinkled ones." —Yelper Perry B. "Cool flavors include a plethora of candy bar tastes — Carmello (Nomz), Reese's (Double Nomz), Mounds, Snickers, and more. My personal favorite of my trip was the Grasshopper — mint frosting drizzled with chocolate on a chocolate cake donut." —Yelper Sarah S.
"Best. Donuts. Ever. I usually don't go for the raised glazed donuts, but theirs are to die for (and enormous). Everything I've had there so far (raised glazed, raised frosted/sprinkles, raised long johns, cake donuts) has been unbelievably good." —Yelper Noelle B. "Best bakery in the metro and has great prices. You can go to fancier bakeries and pay twice as much for less quality donuts." 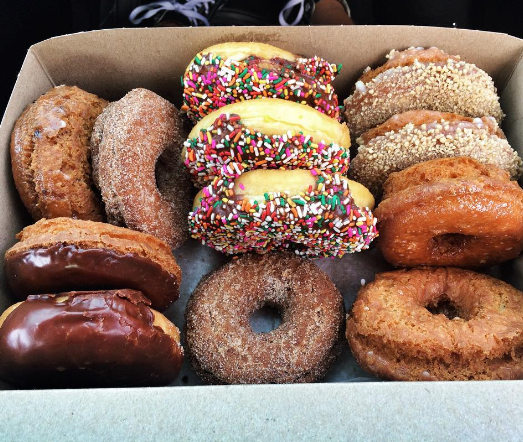 —Yelper Alex K.
"Eight donuts devoured by our family within minutes of purchase. Loved the applesauce cake donut — reminiscent of the apple cider donuts we have in the fall in the midwest." —Yelper Ali B. "We walked down to the arch and stopped for the best glazed donuts ever." 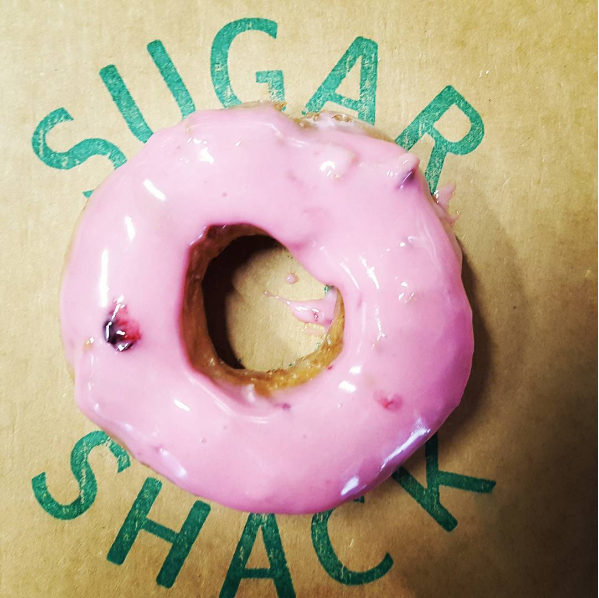 —Yelper Angie D.
"An unapologetic hole-in-the-wall, I love that all of the effort goes into the donuts. The service was warm, and the donuts were out of this world: old-fashioned, not fussy, and downright delicious." —Yelper Lauren T.
"I have no doubt that these are the best doughnuts in Montana, and likely the best in the Rockies and Northwest. These doughnuts are delicious, the variety is great, and there is plenty of novelty for those who want something a little different." —Yelper Jeff L.
"Fantastic donuts! Artisanal donuts are a dying art. This place is a must stop every time I am in Omaha now." —Yelper Steven M.
"They have old school charm and flair. We have a ton of donut shops in Omaha, but none feels as timeless as Pettit's." —Yelper Mike S.
"Ronald's is the place to go for amazing donuts! They're vegan but scrumptious for vegans and non-vegans alike." —Yelper Joanne M.
"Tried a couple of flavors today for the first time and they were delicious! You can definitely tell the difference between these fresh donuts and the generic kind." —Yelper Kim B. "Top That! Donuts has the best donuts at the boardwalk. I love the idea of creating your own donuts." —Yelper Rob M.
"Perfect size, various flavors, and texture. 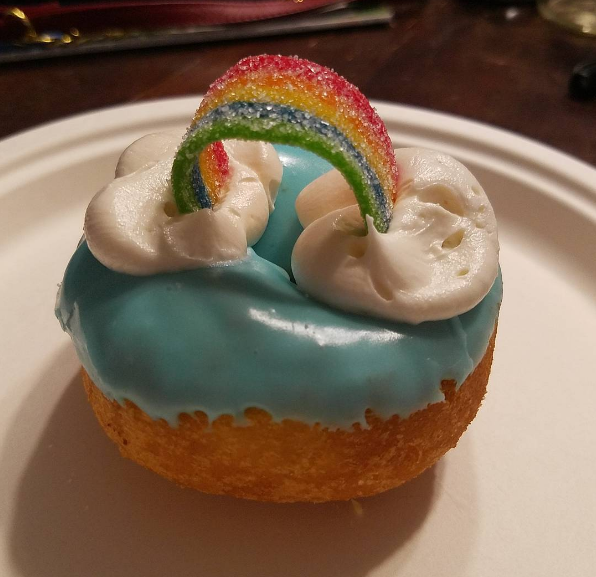 They offer a variety of donuts: I had the chocolate glaze with fruity pebbles on top, while my husband made his own version with lemon glaze and coconuts with crushed peanuts." —Yelper Zach P.
"I was impressed at the crazy concoctions they had. We chose six: chocolate glazed, regular glazed, Boston cream, chocolate-dipped red velvet, chocolate peanut butter, and the blue sky. They were good and creative. I would definitely come back, especially because of their convenient hours!" —Yelper Rachel R.
"The cheesecake donut is amazing. Nutella in a donut? They got it, and it's amazing! And unlike pricey cupcake shops, these donuts cost $2 and are huge." —Yelper Omar S.
"The donuts are huge and dense, yet somehow fluffy. While the base for every creation is the same plain donut, the unique flavors and fillings make them really over the top." —Yelper Ahmed M.
"Want some cereal on your donut? You got it! what about a creme brûlée dessert donut instead?! And don't forget their espresso donut, especially if you're a coffee lover. 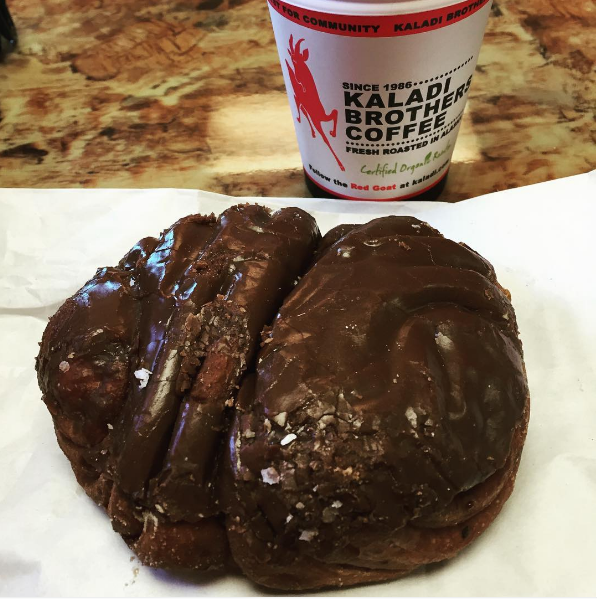 It's not filled like many of their other donuts, but it's packed with an amazing coffee flavor." —Yelper Angel K.
"Move over Disney, Sandy's is the happiest place on earth. The line is always out the door, but the service is quick. The donuts, as well as the staff and management, are awesome." —Yelper John D.
"If you love donuts, especially jelly ones, then jump in the car and get yourself one here. I had a blueberry-filled and it was the perfect amount of donut to blueberry filling." —Yelper Karen Z. "Sweet mother of donuts! You can't help but have more than one donut at this place. Walking into the place, the aroma fills the air, and you know it's going to be good." —Yelper Lizabeth M.
"Any place that has been open since 1960 must be doing something right. The flavors are so colorful and fun — from funny-shaped dunkers to fruity pebbles, you will not be feeling like colors or textures are lacking." 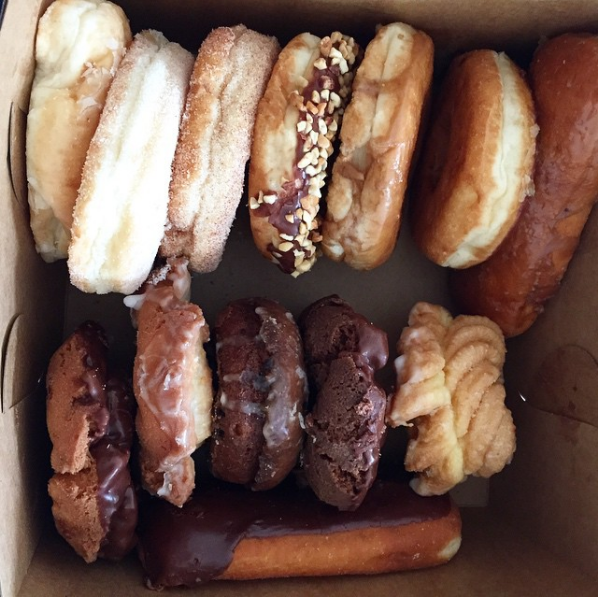 —Yelper Jes P.
"This place has my FAVORITE DONUTS. 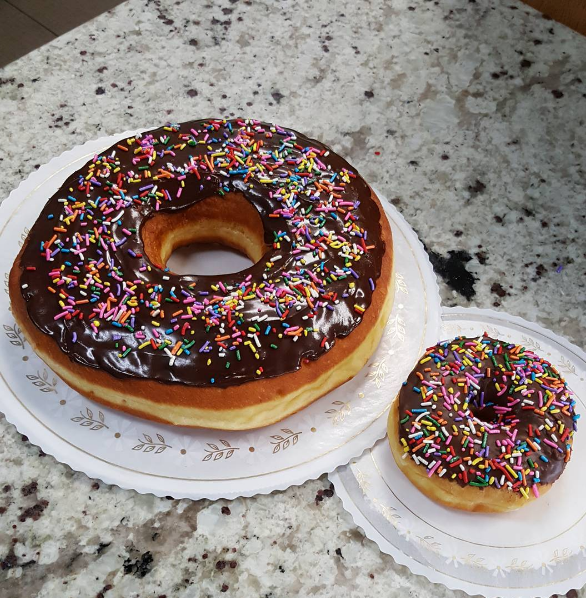 One donut is the size of two anywhere else. The macarons are delicious, the ice cream is delicious.... Even the plain coffee is delicious." - Yelper Ambia C.
"All the macarons and donuts in the world are ruined for me, because I have had the real thing here. The bacon maple donut and hibiscus glazed donuts are legit." 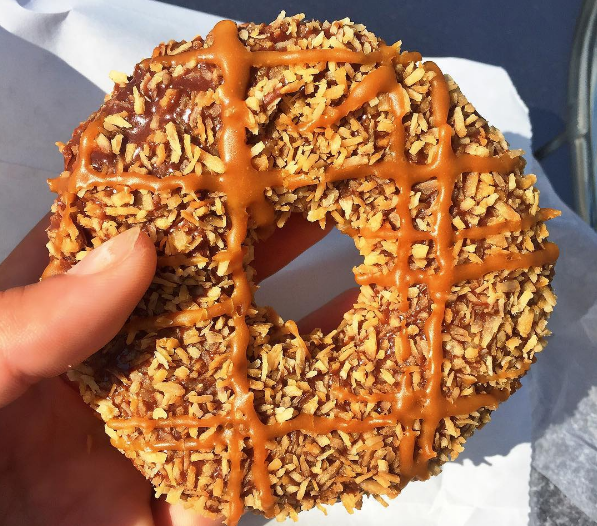 —Yelper Heidi W.
"These are definitely a sit-down-and-enjoy-while-sipping-coffee donut, rather than a grab-and-scarf-down-while-on-the-way-to-a-meeting donut." —Yelper Jeff H.
"For the donut connoisseur. The donuts here are for a more refined palette. Four words = hard apple cider fritter!" —Yelper MC R.
"BEST DONUT OF MY LIFE. My eyes got so wide when I bit into the fluffiest, most delicious donut in the world. I enjoyed the maple bacon donut. I would pay SO MUCH cash for their donut, but believe it or not — they only charge $0.95." —Yelper Stephanie A. "The donuts aren't perfect looking and have a rawness about them. The glazing is beautiful and they aren't particularly photogenic, but mannnnnnnnnn THEY ARE GOOD." 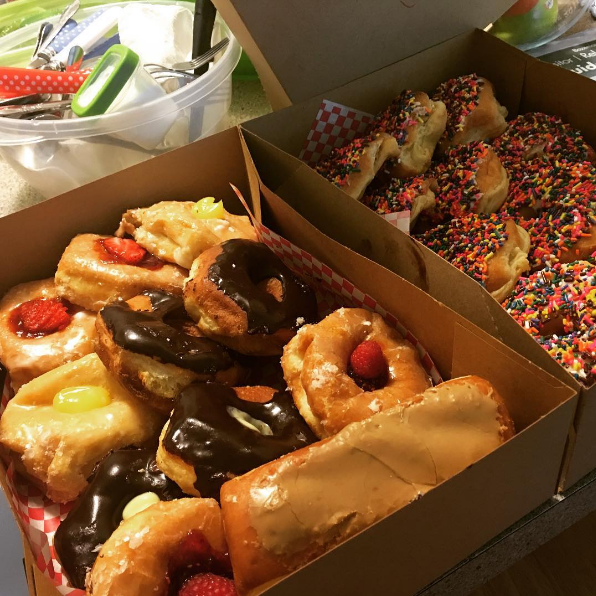 —Yelper Chanel C.
"The best donuts in RI and very possibly the entire world! A true landmark in Rhode island." 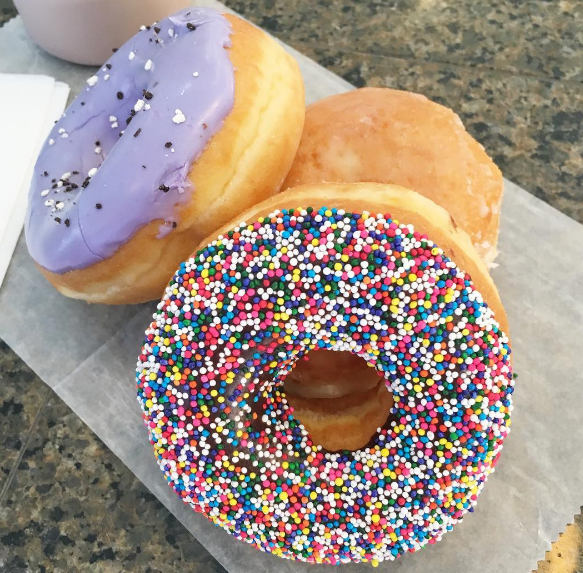 —Yelper heather M.
"The plain glazed is to die for. It's similar to a Krispy Kreme donut but bigger and with a homemade taste — void of that mass-produced baked-goods-taste." —Yelper Jackie O. "The Donut Experiment of Greenville has ruined me! I have never been a fan or ever liked cake-type donuts, but I love that this place has donuts made to order that I can customize to my liking." —Yelper Michael C.
"Love the donuts. The cake donut with white frosting and sprinkles are the best ever. We also love their donut holes, chocolate donuts, and glazed." —Yelper Tami B. "Lots of different kinds of donuts. They even have a donut with BACON!" —Yelper Tony D.
"Probably the best homemade quality doughnuts I've ever had. The shop is small and welcoming. They offer good deals and beautiful handmade mugs." —Jorge F.
"Their Texas Size glazed donut is no joke!" —Yelper Paula B. "Their donuts have a signature orange tinge and are omg mouthwateringly delicious. I had their Bavarian cream filled donut. IT WAS SO GOOD." —Yelper Sarah S.
"As per their name, you have the option of creating your own treat here. Every experience is totally different depending on how you make your dessert. I ordered a Cronut with hazelnut and chocolate ganache filling, and paired it with a coffee gelato." —Yelper Drew R.
"This traditional place has been a true test of time. To this day, they serve the same delicious cookies and donuts of 20 years ago!" 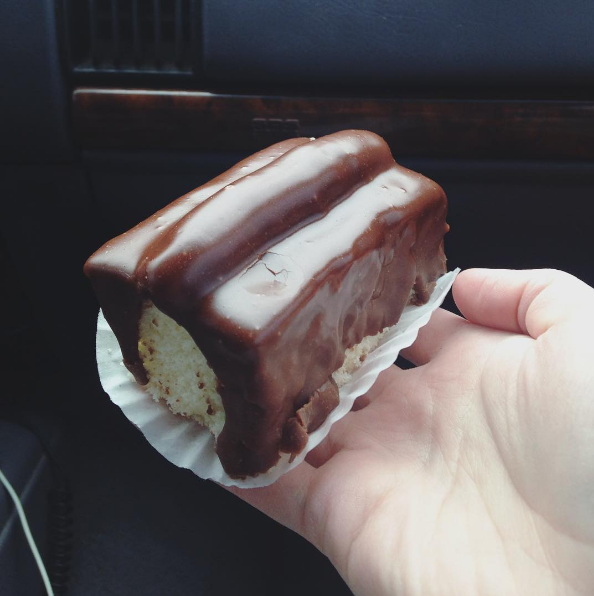 —Yelper Kelly M.
"Awesome little independent bakery. So much better than any chain store in so many ways." 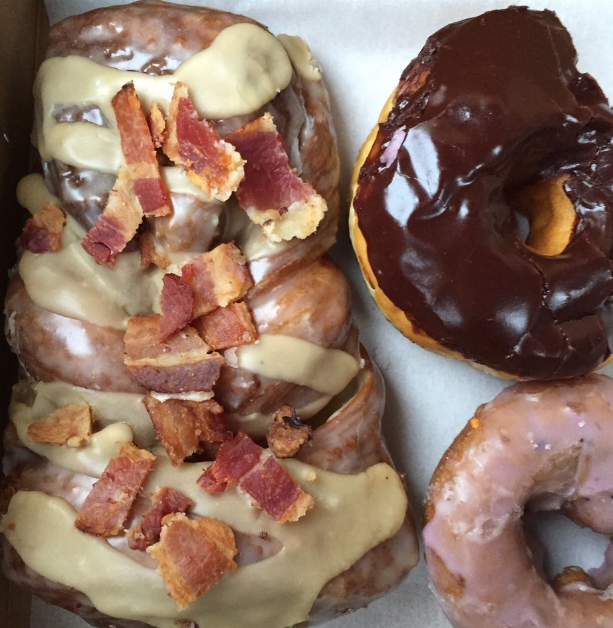 —Yelper Jim S.
"A couple of my favorites: Samoa, lemony poppyseed, maple bacon, and blueberry cake. Like them on Facebook! They have cute challenges and if you come into the store and do one, they'll give you a donut for free." —Yelper Kat G.
"The donuts came out piping hot and fresh, smelling delicious. The donuts are miniature, lasting just three bites each, with a very unique taste; sweet but not too sweet, with a medium consistency, and a fluffy texture. They melt in your mouth and you have to resist the urge to devour them so that you can enjoy them for longer." —Yelper Forrest T.
"A gem of a place! Looks shabby, but the donuts are super fresh and delicious." —Yelper Cat C.
"Best donuts in the area and locally owned. Be sure to try the Yum Yum." —Yelper Jason A. "Each tantalizingly kosher creation is less than one dollar, except for those massive fritters. So, they're accessible in every way — maybe except delivery, but that is for the safety of the entire human race!" —Yelper Jake I. 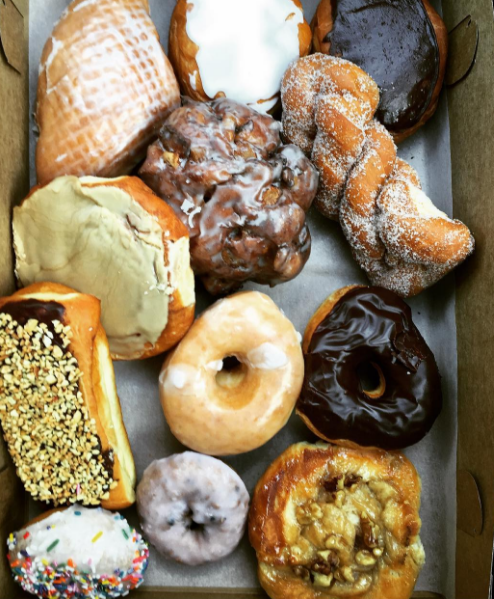 "I have probably never loved a donut more than the donuts I purchased at Greenbush. I love old-fashioned and cake donuts, and they offer plenty of options. The coconut with white icing is my absolute favorite." —Yelper Clara E.
"While Delish only offers mini donuts, each one is a treat. They are crisp on the outside, moist and crumbly on the inside, and covered in decadent ganache, vanilla, or cinnamon sugar. There are also seasonal flavors like chocolate lemon, blueberry, huckleberry, Reese's, and PB&J." —Yelper Leah W.